A Lockheed Martin-built spacecraft for NASA‘s Mars mission lifted off Saturday aboard United Launch Alliance’s Atlas V rocket from Vandenberg Air Force Base in California. The Interior Exploration using Seismic Investigations, Geodesy and Heat Transport lander is scheduled to reach Mars on Nov. 26 and perform scientific investigations through Nov. 24, 2020, NASA said Saturday. The InSight spacecraft separated from the rocket’s Centaur second stage approximately one and a half hours after launch and established contact through the agency’s Deep Space Network. “InSight will not only teach us about Mars, it will enhance our understanding of formation of other rocky worlds like Earth and the Moon and thousands of planets around other stars,” said Thomas Zurbuchen, associate administrator for NASA’s science mission directorate. Lockheed said it will oversee the cruise phase of the lander designed to study the red planet’s interior through observations of rotational variations and heat output measurements. 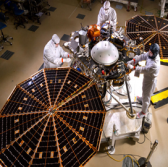 NASA’s Jet Propulsion Laboratory oversees the InSight program for the agency’s science mission directorate as part of the Discovery Program. Instruments that flew aboard the InSight spacecraft include the Seismic Experiment for Interior Structure platform from France-based CNES and the Heat Flow and Physical Properties Package tool from Germany-based aerospace center DLR. NASA’s Launch Services Program at the Kennedy Space Center in Florida oversees the launch service procurement, analysis, launch management and integration efforts.